It's Hip 2 Serve! 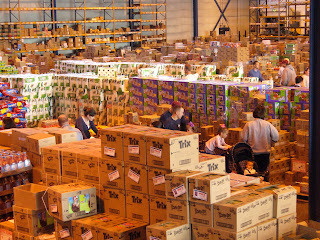 : Commissary Case Lot Sales Worldwide in May! The word on the street is that the May case lot sale will be the biggest spring sale yet, offering about 100 more products than last year's 260. For those of you not familiar with these great sales, they give you the opportunity to stock up on bulk-sized products ranging from canned goods, beverages, toilet paper, paper towels, produce, fresh meat, seafood, frozen foods, health and beauty items, pet supplies, cleaning and laundry products and more. Some 50-60 percent of the items are sold in "club pack" product assortments similar to the oversized or multiple products sold at commercial warehouse club outlets. Click here to find out when your commissary is hosting a sale next month. These sales typically only happen twice a year so make sure you "save the date!"